When companies search for the “Best Fit” 3PL, they frequently look to do what they do best and then just handoff their products to the 3PL and let them do what they do best. At Custom Goods we have created another option to the norm – it’s called Co-Gistics™ Collaborative Optimized Logistics which invites potential customers to look at CG’s 4PL solution as an outgrowth of their customer’s company culture, shared values and goals…a continuum to optimize flow. The Best Fit can be best made by looking for a 4PL that meets these attributes below. • Leading Edge Technology: The ideal 4PL partner has leading edge IT and Warehouse Management System (WMS) in place to provide real-time updates, inventory control, customized reporting and data collection/evaluation. The 4PL should also embrace any required integration. CG’s IT creates a transparent, seamless bridge between it’s teams and the customers key personnel. Our WMS System provides a single, intuitive Microsoft Windows application that provides: Warehouse Management, Internet Portal, Order Management, Small Parcel Management, Billing Integration and EDI. • Lean Practices: Demand that your prospective logistics company has lean manufacturing standards and continually seeks efficiencies and innovative solutions to reduce costs and maximize throughput. Examples include more efficient driver routes/ gps tracking, reduced port to dock to stock time and minimized materials waste. CG continually seeks efficiencies and innovative solutions to reduce costs and maximize throughput. Our dedicated teams immerse themselves in the customer’s culture and look for ways to optimize the process. We point to six (6) Kaizen Awards and Toyota’s 2014 Strategic Logistics Partner of the Year Award. Our trucking division – Custom Air Trucking (CAT) has the ability through both Datatrac (air freight) and Trinium (ocean freight) software to monitor drayage and share a full array of reporting with our Customers. • Mastery of the Industry: Eliminate a long learning curve by selecting a company that already specializes in your industry. Also, a firm with strengths that your company lacks is preferred. CG has the ability to work for Customers through leading Freight Forwards or when the situation dictates a hybrid solution to a customer’s one off needs, Custom Goods can design a complete package – from space, to transportation, to customs, FTZ & Boned Services, to Transloading & Cross-Docking, to packing, kitting and freight consolidation – We are set up to meet or exceed your needs! • Prompt, attentive service: Your outsourcing company should understand the importance of timely order fulfillment and reputation/brand preservation. It should be available 24/7 to meet your needs and be trusted to work proactively. At CG we talk about dedicated teams, CSR people that connect with the customer on a daily basis and help find solutions and lastly achieving yearly objectives. Bottom line…CG’s Chicken of the Sea team handled 4.7 million cartons IN and OUT over 2013-14 at a 99.908% accuracy level. • Agility and adaptability: The best 3PL providers are nimble enough to take on rush orders, respond to change and problem solve on the spot. They should demonstrate versatility and be able to complete jobs of any size and varying levels of complexity. CG has always said we are big enough to implement national programs yet small enough to respond and problem solve on the run. CG’s Caron/South Bay and IE General Managers have 40+ years of experience (combined) and draw from their successes in guiding their dedicated teams expectations, goals and throughput. Our culture is quite simple – When your company culture is total commitment to customer satisfaction, you approach every order with a common focus and goal – meet or exceed the customers expectations! • Ability to grow with you: Determine if your logistics candidate can meet your needs now and in the future. 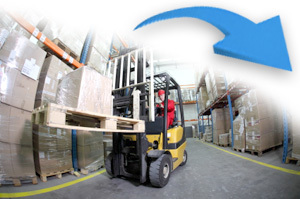 Do they have enough warehouse space, proper equipment and compatible technology? Can they expand if required? the space & services to achieve our mutual goals. • Geographic desirability: Ideally, you want a provider with the shortest route between manufacturing and your customers. In turn, this conserves fuel and maximizes delivery speed for a competitive advantage. CG’s robust LA Port presence, Customs relationships, Bonded/FTZ Warehousing, Transloading and Cross-Dock services can cut days off “Dwell Time”. A good example: CG was given existing/projected volumes of 100 plus containers per month, typical drayage, storage and trans-load times to out-bound trucking on average of 2.5 days. Based on what we knew, CG set out to; reduce time at the port, improve CFS process, schedule night time drays, manage tasked warehouse associates, track inventory and incorporate pallet placards and sky bar locations…all to reduce Dwell Time. The end result over 6 months was an optimized supply chain flow! CG reduced Dwell Time from 2.5 days to 1.6 days and through our Co-Gistics™ Collaborative Optimized Logistics, we will continue to improve the process! • Cultural fit: Vital to clear communication, process implementation and ongoing operations. In order to continually exceed our customer’s expectations CG works to establish mutual goals and benchmarks to achieving them. Through dialogue, collaboration and process analysis, CG continues to win yearly Kaizen Awards. • Solid reputation: Checking company references, as well as obtaining feedback from industry peers, trade magazines and associations, is highly recommended. Research each firm to ensure fiscal stability. CG has over 50 years of award-winning logistic service in Southern California, working closely with leading Freight Forwarders and their clients plus directly with a select group of companies that have unique logistic needs. Toyota, Nissan, Honda, Hyundai-Kia, Chicken of the Sea, Auto Zone, Molex, Moen, Union Pacific, Honeywell are among our satisfied customers. • Competitive pricing: Logistics is highly competitive, so negotiate your terms. However, having a proven, dependable provider is paramount, especially in the case of a crisis or error. A cheap rate doesn’t matter if deliveries are compromised. CG is continually studying process – start to finish. Our rates are competitive and are based on proven practices and timely fulfillment. We have the ability to provide conventional logistic services or design a hybrid solution to meet both your needs and your price expectations. View this informative 3pl vs 4pl video that we found! 3PL vs. 4PL and why everyone’s getting all confused about it.